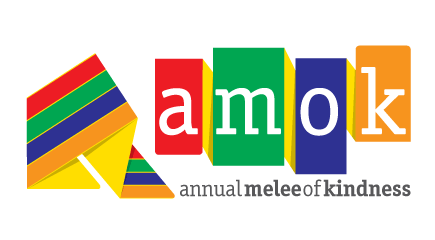 AMOK stands for the Annual Melee of Kindness. In past years, it’s been a global day of kindness that got people all over the world out into their communities committing whatever random act of kindness they wanted. Last year, AMOK was a marathon where we accomplished tons of kindness mayhem over four weeks. This year, we are switching gears and running AMOK for 48 hours. How much kindness can you accomplish during a weekend AMOK ‘staycation’? Who can organize the largest group of people involved in a single project? Imagine all the kindness we can infuse across the globe during these 48 hours! Post what you do to your twitter and use the hashtag #AMOKRA19, so everyone can see the amazing, kind things you’re doing! Stay tuned for updates about AMOK 2019 in the coming days because we have some amazing surprises up our sleeves this year. So get out there, run AMOK, and wow us with kindness! The Applicant agrees to maintain all necessary licenses, permits and approvals, and to conduct its business in compliance with all applicable local, state, federal and national regulations. The Applicant shall indemnify, defend and hold harmless Random Acts, its directors, officers, members, agents and employees against any and all demands, claims, actions or causes of action, liability, loss, damage or expense of any nature whatsoever. Not a problem. If you have any further queries or need any further assistance, you can get in touch by emailing events@randomacts.org.